UL 1008 Automatic Transfer Switch Equipment for use in Emergency Systems, file #E58962. 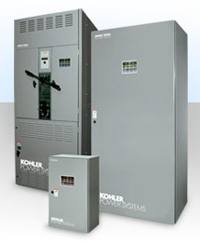 Completely separate utility and generator set side power switching units provide superior reliability through redundancy (no common parts) and excellent serviceability. Inherent stored-energy design prevents damage if manually switched while in service. Heavy duty brushless gear motor and operating mechanism provide mechanical interlocking and extreme long life with minimal maintenance. Phase to phase sensing and monitoring with 0.5% accuracy on both sources.